Mane install shop fronts in Warrington. Warrington shop fronts supplied, fitted and repaired by Mane. All of our shop fronts are made from highly durable aluminium, aluminium is strong and has high anti corrosive properties unlike wood or plastic, aluminium gives a smooth modern finish and can comes powder coated in virtually any colour. Aluminium shop fronts last for many years and are very easy to maintain. All of our shop fronts conform with disability access regulations. Mane can install a standard shop front and roller shutter in 1 working day in the Warrington area. 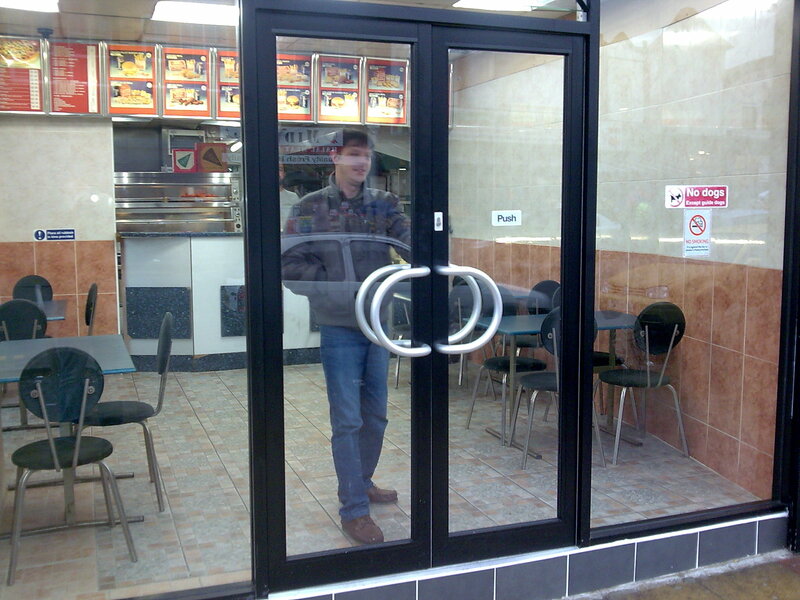 Mane will design the shop front you require, we can install with the type of glass and shop front door you require. Shop front prices and quotes in Warrington. If you would like a free no obligation quote for a shop front in Warrington please tel: 0161 320 9322 or email neil@manedoors.com if you give us your rough sizes and the amount of doors you require we will be able to give you an idea of cost. Aluminium and glass door repairs in Warrington. Mane carry out repairs to aluminium and glass shop front doors throughout the Warrington area, Mane can change aluminium door closers, change floor springs, replace broken glass and repair doors that are catching on the floor. Mane can replace or install new shop front doors, there is no need to replace your full shop front so you can save on costs. Mane will be able to match the colour o your old shop front and we will also change your concealed door closer.